VietPress USA (Feb. 7, 2018): GUESS is very famous brand name of American Lady Fashion. 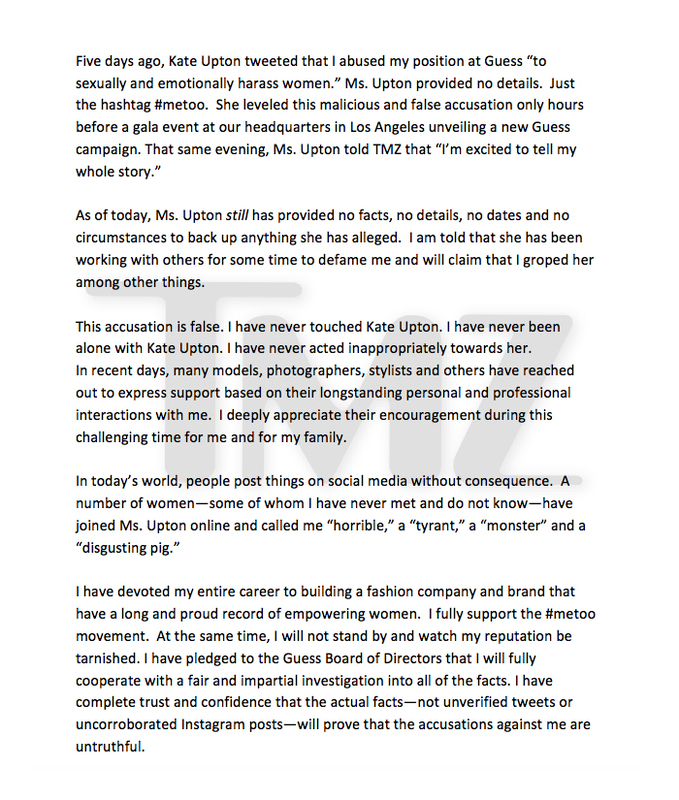 Today Model Kate Upton publicly accuses co-Founder Paul Marciano of GUESS for sexual abusing her. Model Kate Upton, born name as Katherine Elizabeth Upton is an American model and actress, known for her appearances in the Sports Illustrated Swimsuit Issue. Upton was named Rookie of the Year following her first appearance in 2011, and was the cover model for the 2012, 2013 and 2017 issues. She was also the subject of the 100th-anniversary Vanity Fair cover. Upton has also appeared in the films Tower Heist (2011), the Layover (2017) and The Other Woman (2014). Upton born on born June 10, 1992 in St. Joseph, Michigan. She is the daughter of Shelley (née Davis), a former Texas state tennis champion, and Jeff Upton, a high school athletics director. Her uncle is U.S. Representative Fred Upton. Upton's great-grandfather, Frederick Upton, was co-founder of appliance manufacturer and marketer Whirlpool Corporation. In 1999, Upton moved with her family to Melbourne, Florida, where she was a student at Holy Trinity Episcopal Academy. As a young equestrian, she showed at the American Paint Horse Association (APHA) and competed at a national level. With her horse Roanie, she won three APHA Reserve World Championships – 13 and Under Western Riding, 13 and Under Horsemanship, and 14–18 Western Riding. She was named the 13 and Under Reserve All-Around Champion, giving her a total of four reserve championships (2nd place). In addition, Upton ended up third overall on the APHA youth Top Twenty. With a second horse, Colby, she won 14–18 Western Riding and was included in the top 5 in 14–18 Horsemanship and 14–18 Western Pleasure in 2009 (https://en.wikipedia.org/wiki/Kate_Upton). On Wednesday, the 25-year-old model gave a powerful interview to Time, revealing abusive treatment from the fashion mogul, starting from when she was 18. Upton described how Marciano “insisted” on walking her to her hotel room, but the photographer intervened. “I was so relieved and felt like I had barely escaped,” she said. The model went on to work for Sports Illustrated, and in 2012, Guess reached out with a $400,000 gig — the company’s highest offer ever, says Upton — which she cautiously accepted, and then refused at the last minute.